Local businesses are often inspired to give back to the community that supports them. Vermonter owned businesses make local investments not only by employing workers, preserving downtowns and participating in local economies, but also through community initiatives and programs. 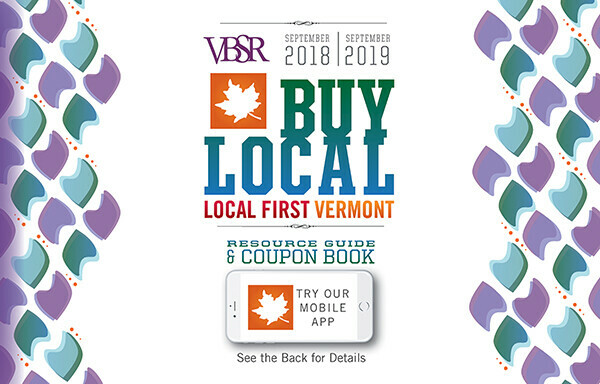 Local First Vermont makes it easier for Vermonters to support the businesses that invest in their communities with the Buy Local Coupon Book and Mobile App. “Though it’s great to save money when you shop using the Buy Local Coupon Book and App, you are actually doing much, much more. Each time you shop locally, you help create a stronger community and more resilient local economy,” said VBSR Executive Director Jane Campbell. A number of Brattleboro business leaders gathered today to share their commitment to community to encourage shoppers to Shop Small this holiday season. Shop Small Saturday is a nationwide movement fueled by shoppers who support vibrant local communities. Shop Small Saturday is celebrated every year on the Saturday after Thanksgiving Day, this year it falls on Saturday November 24th. Jon Megas-Russell, the Brattleboro Co-op’s Marketing and Community Relations Manager, shared why they feel buying local is integral, “We strive deeply to make impact wherever possible by focusing and purchasing local products and food. Our focus on local allows us to contribute to a growing and resilient economy that builds stable wages, jobs, and makes Vermont a great place to live. We are proud to define local as the entire state of Vermont or 100 miles radius from our Co-op here in Brattleboro, which contributes $4M to our annual sales.” At the Brattleboro Food Co-op, one of their cooperative principles is “Concern for community.” Their initiative, the Bag a Bean program, raises money for local community programs by donating 5 cents for every reusable bag or container used during a shopping trip. VSECU also stressed the impact of local investment. “When you buy local, you’re giving a gift to yourself and your community with every purchase,” said Simeon Chapin, Director of Community and Social development for VSECU. “For every dollar you spend at a Vermont business, $.45 of that stays right here at home, helping to build strong neighborhoods and support fellow Vermonters. VSECU is proud to be a part of a growing movement of cooperators, from Brattleboro to the Northeast Kingdom, who believe that together we can make change with simple choices about where to spend our hard-earned dollars.” VSECU powers Point to Point, which is a beloved community cycling and running event that raises funds and awareness for the Vermont Foodbank. Community initiatives like these by the Brattleboro Co-op and VSECU are why it is so important to support Vermonter owned businesses.